Smithsonian American Art Museum/National Portrait Gallery Library. Corcoran Gallery of Art, Corcoran Library, Artists’ Book Collection. Boston Museum of Fine Arts, W. Van Alan Clark Jr. Library. Kohler Art Library, Madison WI. Louisiana State University, Special Collections, Baton Rouge. Mortimer Rare Book Room at the Neilson Library, Smith College. University of Virginia, Shirley and Albert Smalls Special Collections Library. Charlottesville. This is a look at the historical and contemporary culture of dog-fighting and breeding for “gameness”. Printed by letterpress, this book is bound as a classic, gentlemanly manual in a brown full-cloth binding. Approximately 8”x 6”, it includes a smaller 4”x3” removable book in a pocket. Winner of the 2005 Ann Bremer Memorial Artists’ Book Prize at the San Francisco Art Institute, A Deeply Game Dog contains two found texts by different authors. The first is a vernacular explanation of genetic science. The second (mini-book, “Jolly Jumper’s Aftercare Guide”), urges a strong, paradoxical morality. There is a section of letter-pressed dog genealogy charts, and a portrait gallery of dogs and handlers. The book’s images, printed by letterpress, are from original ink drawings and etchings, based on historical photographs and pedigree charts. 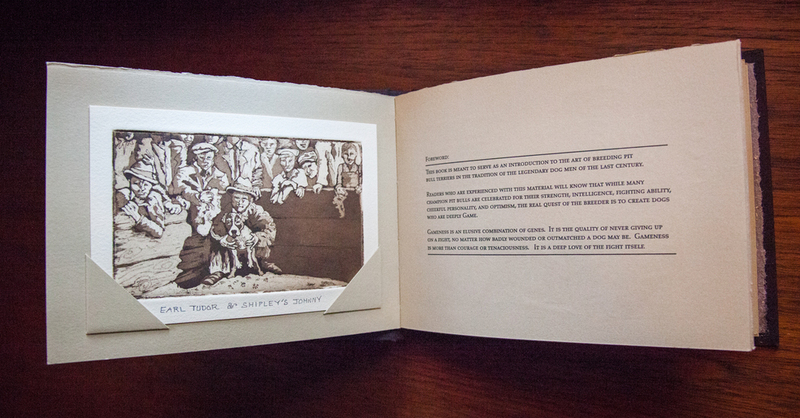 An etching, (“Earl Tudor with Shipley’s Johnny”) is mounted as a removable frontispiece in half the edition. Edition of 20, 2005: $800 without etching [still available], with etching [SOLD OUT].